VIENNA, Nov 5, 2015 – The murder of yet another journalist in Pakistan this week because of his journalistic work once again raises the issue of journalists’ safety and the importance of ending the impunity both in that country and worldwide. Senior journalist Zaman Mehsud of Tank District in Pakistan’s northwest Khyber Pakhtunkhwa province was gunned down on Tuesday, one day after the world marked the annual International Day to End Impunity for Crimes Against Journalists. According to local media, Mehsud – who was working with the Daily Ummat and Nai Baat newspapers, and who served as president of the South Waziristan chapter of the Tribal Union of Journalists (TUJ) and as district coordinator of Human Rights Commission of Pakistan (HRCP) in Tank District – was shot five times while riding his motorbike near the Dabara refugee camp in Tank. Journalists and media workers in Pakistan face a strong culture of impunity, as the Pakistan Press Foundation (PPF), headed by Pakistani journalist and IPI Executive Board Member Owais Aslam Ali, noted in a report released to mark Impunity Day. The group called on both Pakistan’s government and the media to do more to protect journalists and to apprehend their killers. A statement that PPF posted on its website on Monday describing the report appears below in full, courtesy of the PPF. The complete report is available in English for download here or via the PPF’s website. 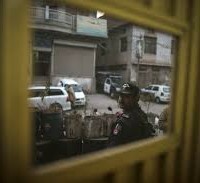 A report on safety of Pakistani media professionals presents a bleak picture of level of insecurity faced by Pakistani journalists and calls [for] serious efforts by governments and media to change the present situation where those that kill, injure, abduct and threaten journalists are almost never punished. The Report on Safety of Media Workers released by Pakistan Press Foundation (PPF) on the International Day on Impunity documents that since 2001, 47 media workers have been murdered, 164 injured, 88 assaulted, 21 abducted and 40 detained. In addition 24 media professionals died while covering dangerous assignments. There have been convictions in only two cases out of 384 cases of violence against media. Because of conflicts and insurgencies the number of murders and killings [are] the highest in Balochistan, Khyber Pakhtunkhwa and FATA. Since 2001, 21 journalists and media workers were killed in Balochistan, 19 in Khyber Pakhtunkhwa, nine in FATA and 15 in Sindh, four in Punjab and three in Islamabad. Threats and violence have forced many journalists to move from these danger zones and to leave the profession or to resort to self-censorship, particularly in conflict areas. As a consequence, news reports from conflict areas are based on press releases, not on observations by independent journalists. Thus, new reports that are published or broadcast lack credibility and do not inform the public in an objective manner. The two convictions by courts were in Sindh for the murder of Daniel Pearl of the Wall Street Journal and Wali Babar of Geo Television. In both the cases the federal and provincial governments seriously [pursued] the cases because of pressure from the media organisations of the murdered journalists. The report thus recommends that criminal cases should not only be registered but should also be properly investigated and prosecuted against the perpetrators of violence against media. The report also calls on media itself to take the lead in ensuring safety of media practitioners and to ensure long-term follow up of cases of assault on media organisations and workers. Apart from murders and killings, the largest number of cases of violence against media occurred in the province of Sindh. Out of a total of 164 journalists and media workers injured and assaulted since 2001, 91 were in Sindh. Surprisingly the second place in these categories with 70 assaults was Islamabad, which was largely due to the assault on large number of media practitioners by supporters of Pakistan Tehreek-i-Insaf (PTI) during the Dharna in 2014. Forty-eight media practitioners were injured and assaulted in Punjab, 23 in Khyber Pakhtunkhwa and 14 in Balochistan. This reluctance to hold those who use violence against media professionals exists even in high profile cases such as that of murderous attack on Hamid Mir in 2014, and the murders of journalists Saleem Shahzad in 2011 and Hayatullah Khan in 2006. In all three cases high profile commissions were set up but the result has been nil. Hamid Mir of Geo Television received six bullet wounds when he was attacked in Karachi in April 2014. The government set up a judicial commission in response to national and international furor over the attack. The commission was supposed to submit a report in 21 days. However, 18 months have passed and the commission has still not submitted the report. Meanwhile, Mir and other journalists continue to receive threats and face a sense of increasing insecurity. The report calls for the early completions of the commission report, which should fix responsibility and be made public. Cases that are not high profile are covered up at the local level. One such example is that of the fatal shooting of Shan Dahar, reporter of “Abb Takk” TV channel on the night of Dec. 31, 2013 in Badh, in Larkana district. He was shot in his back and was taken to the hospital where he remained unattended until he succumbed to his injuries many hours later on Jan. 1, 2014. The local police, in an investigation that his family believes to be flawed and motivated, termed the death an accidental death as a result of shooting [into the air] on New Year’s Eve. However, the family believes he was targeted because of his stories on use of fake medicines in local hospitals. Despite repeated promises, including those by Minister of Information and Broadcasting Pervez Rashid, to have the case re-investigated, no action has been taken by the provincial or federal governments. The report emphasizes that free media is essential to democracy in Pakistan and for promoting transparency and accountability, a prerequisite of sustained economic uplift, and that the impunity enjoyed by those who attack Pakistani media is seriously hampering independent journalism in Pakistan.